This year we, at Top Removals, have decided it is time to give back to the most unfortunate members of our society – youngsters in social care. 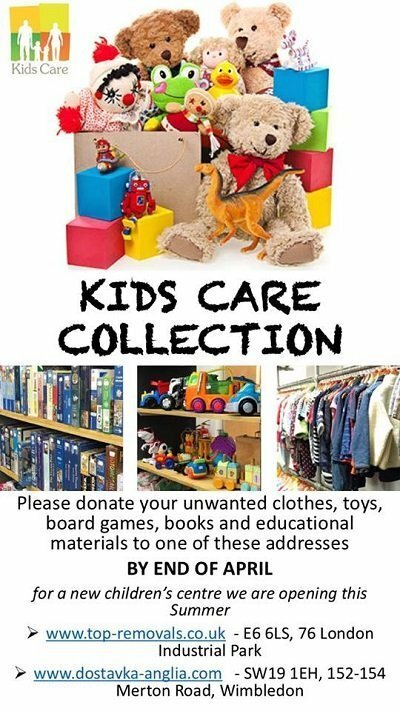 Our friends at Kids Care need help in raising funds and collecting toys and clothes for a new children’s centre in one of the less developed countries in the EU – Bulgaria. Thanks to the big heart of the British people, a massive campaign has started in bringing joy and happiness to the many abandoned children. Everybody at Top Removals takes very seriously this initiative, as the founders of the company are from Bulgarian origin and feel, it is their duty to help with whatever they can. The campaign is managed by a nonprofit organisation called Kids Care. Founded in 2013 this organisation has dedicated its work to help the forgotten children locked away in orphanages all across Bulgaria. Thanks to the efforts of so many warmhearted people, hundreds of kids receive warm clothes, toys and books each year. As Mother Teresa said, “It’s not how much we give but how much love we put into giving.” We humbly ask all of our customers and friends to help with whatever they can. If you are house moving to and from London, this is the perfect opportunity to donate your old toys and clothes. Even if you are just decluttering during the Spring cleaning, now is your chance to completely transform a child’s life. You have no idea what it means for a kid to receive love and acceptance. Or maybe you do and want to experience the warmth and satisfaction of giving again? If you want to read more about our partners Kids Care, check their facebook page. Here you can learn about their Bulgarian partners and the great work the organisations have achieved thanks to the generosity and kindness of the British people. You can get to know some of the children we have helped and learn what a great impact the simple act of donating an old teddy bear has on the lives of these unfortunate youngsters. So during this year’s house relocation consider connecting Top Removals. You will not only receive a perfect service but will get the chance to do something good. Even if you never meet the kid whom will receive your gift, this youngster will know that somewhere, there is a great person who has decided to spend a minute of their life making an unsuspected child smile.